I now have in my possession another original piece of the Gorilla, a Knucklehead dragbike from the early 1950's, that being the transmission. And a fine piece it is. Simple, effective, and a down right cool piece of drag racing technology/history. When I began drag racing in the mid '80s, Harley specific drag racing was something new, and it lured all lot of racers out of retirement. These were the men who had kept Harleys on the track through the 70's when it was getting increasingly tough to compete with the Japanese imports which came from the factory with such amazing performance. The Harleys of that era were still pretty impressive when you consider the farm tractor technology they were based upon, but they just were not keeping up on the strip. 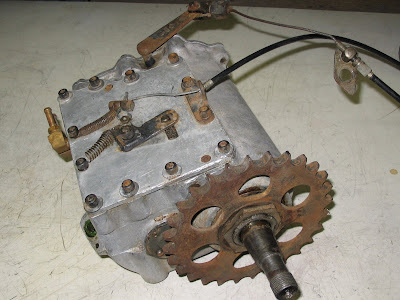 Some of these Harley racers who pulled their dragbikes out of the dark corners of their garages for one last stab at glory were still using this same basic transmission from 1950. So, the transmission is a stock Harley 4 speed case, modified to work as a two speed. 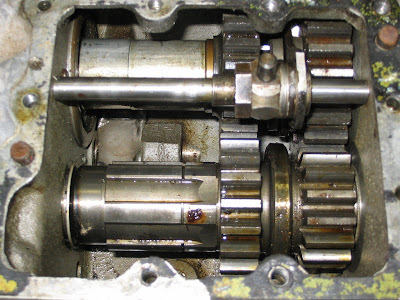 Internally, there is mainshaft 3rd and 4th gears, along with countershaft 3rd and 4th gears. One shift fork does the gear change from 3rd to 4th via a handmade top cover that takes the place of the old "jockey" lid. 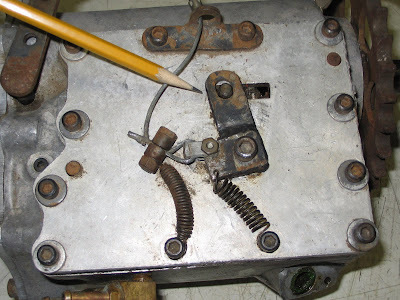 Back in the 1980's, I was lucky enough to have another racer explain how the transmission worked, so I have not had to spend time scratching my head and speculating. Obviously you would start the run in 3rd gear. 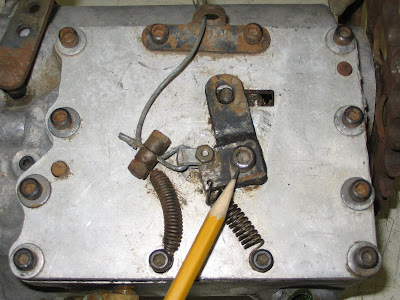 A "clutch lever" was hooked to the arm on the shift fork on the custom lid. Once underway in 3rd gear the rider would begin to squeeze the lever as the bike got near the shift point. Once the engine passed its peak and the horsepower started to drop off, it would unload the shift dogs enough to allow the shift fork to slide over into high gear. Clutchless shifting under wide open throttle in 1950! Amazing! In modern day motorcycle drag racing, you will only see Top Fuel bikes with 2 speed transmissions. Nearly any gas dragbike will have multiple gears to get as much mechanical advantage as possible. Three, four and five speeds are not at all uncommon. So why did this early 2 speed work with even the gas bikes of the time? The answer has a lot to do with the tire technology (or lack of it). There just was not enough traction available to take advantage of any lower gearing. Couple that with the near impossibility of shifting the old jockey lid 4 speed quickly, and you can see why this transmission was a winner. The approach that seemed to work the best was to gear high, and spin the tire through much of the pass.